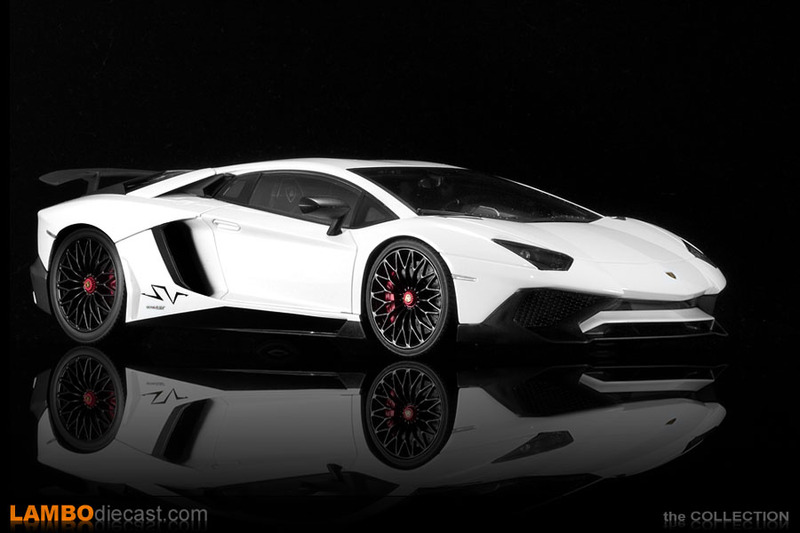 Together with the impressive Rosso Bia finished Lamborghini Aventador LP750-4 Superveloce in 1/18 scale, Kyosho released a Bianco Isis version, a solid white with a glossy top coat ... now I really like white Lamborghini, especially the Bianco Canopus pearl metallic matte white ... but a glossy white sure looks amazing with all that matte black paint a satin carbon fiber on the Aventador Superveloce ... so I got this white model too. 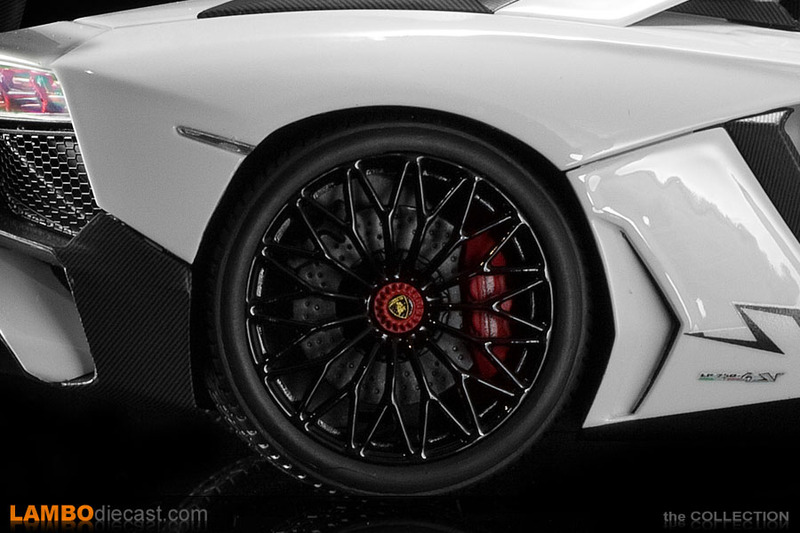 I love the fact Kyosho went with the red center locks and red brake calipers on this model, the Rosso Bia version came with black calipers, but on this white one the red looks so much better behind the glossy black Diantus wheels ... which are perfectly reproduced in 1/18 scale, even the low profile tires look amazing on this Kyosho. 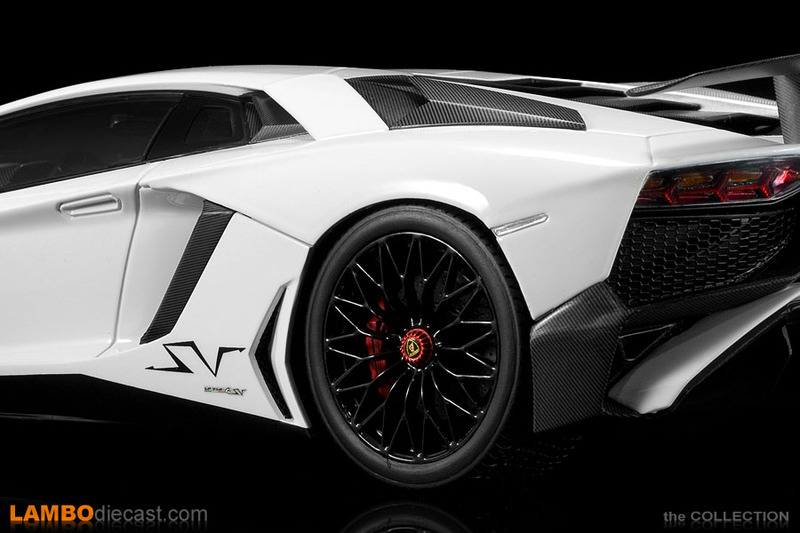 This Bianco Isis version of the Aventador Superveloce was put together with the same options as the Rosso Bia one, satin carbon fiber finish on the vents in front of the windshield, on the air intakes behind the side windows, on the 'blade' of the large side intake, on the fixed intakes next to the engine cover, that also shows carbon fiber fins, and naturally on that massive Superveloce rear wing, adjustable on the real car while the Kyosho model does show the special fixture of the wing ... a very nice detail. 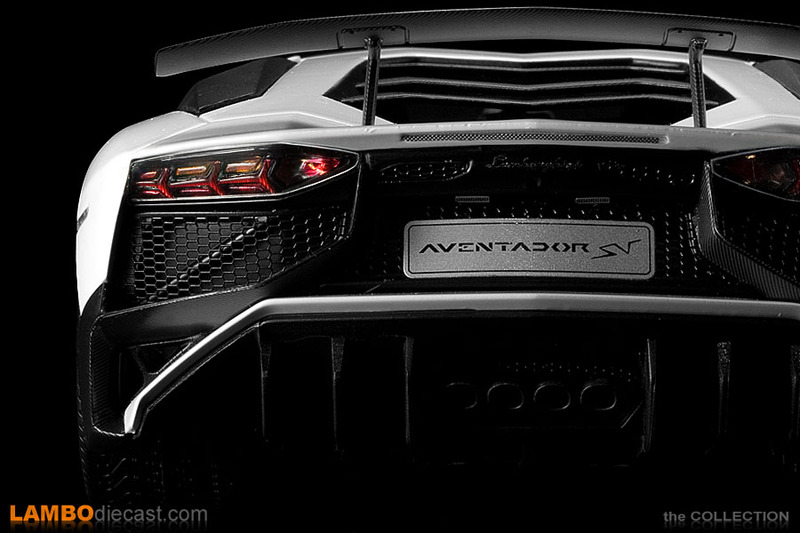 The rest of the special Superveloce items like the front spoiler, exterior mirrors, and side sill are covered in matte black (note that you can get a clear carbon fiber finish on these parts too on the real car) while the bespoke rear diffuser is a mix of carbon fiber and matte black paint ... exactly as on the real car. 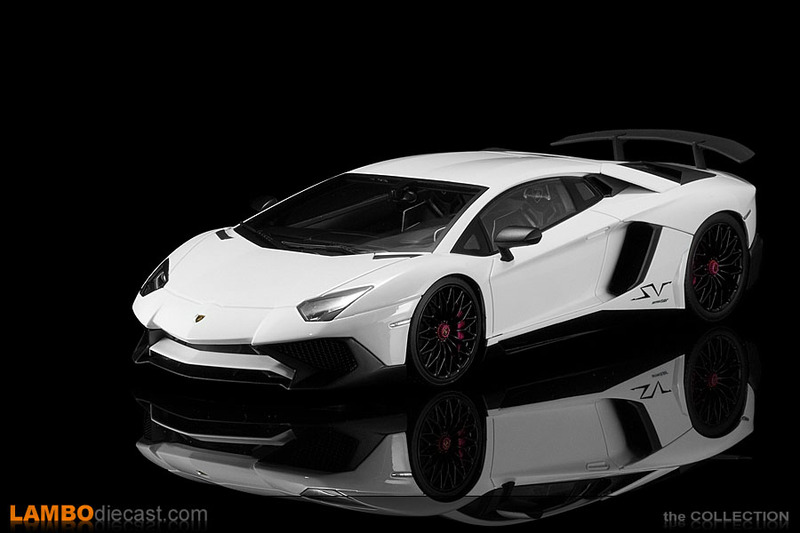 The Kyosho Bianco Isis Aventador Superveloce comes with a small black SV script on the side ... it would have been a nice idea for Kyosho to use the large SV above the wheel on this shade ... on a white car like this all those black and carbon parts really contrast ... she looks amazing in this shade. 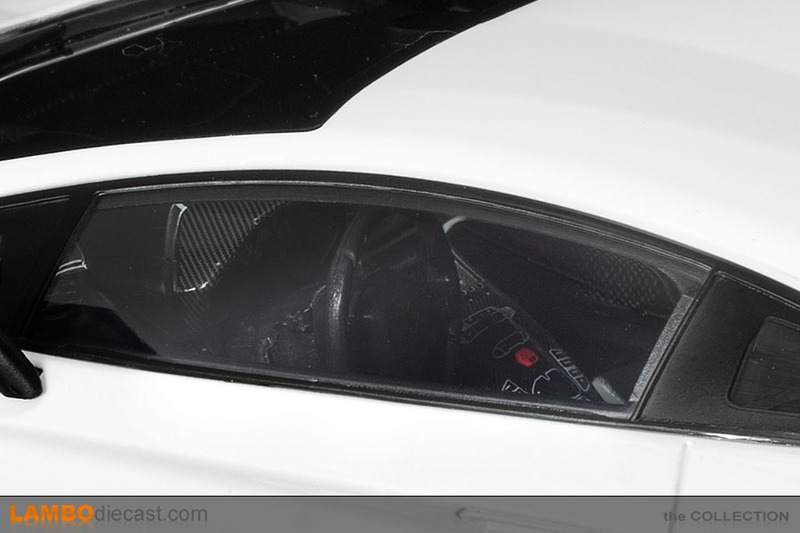 While the Rosso Bia one comes with the Nero Cosmos/Rosso Alala combination on the carbon fiber sports seats, the Bianco Isis shows a very nice Nero Cosmos/Bianco Leda combination ... this means you can see more details inside this shade because of the white livery. 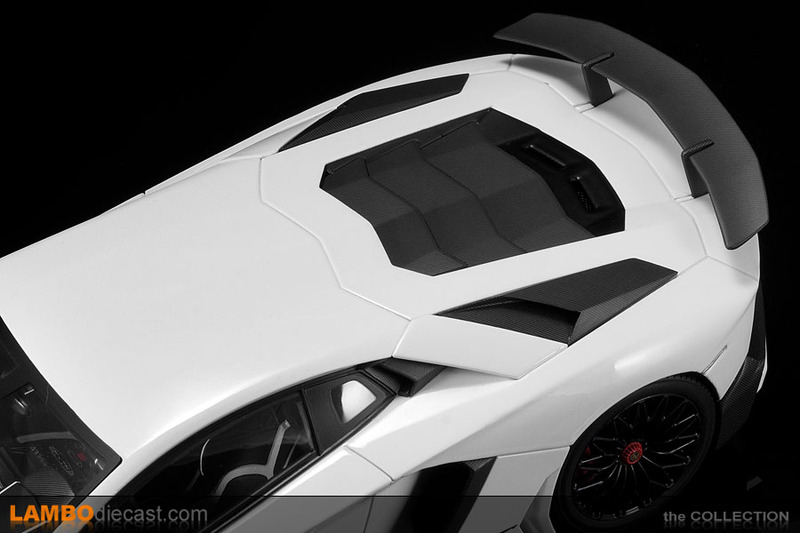 The white piping on the seats looks great, the large 'Y' shaped sections in white are impressive while that Raging Bull crest on the headrest is just menacing, again the 'Interior Carbon Fiber Package' is there with the carbon fiber finish on the dashboard pod while this also adds Carbon Skin on the headliner with white pinstriping in this case. 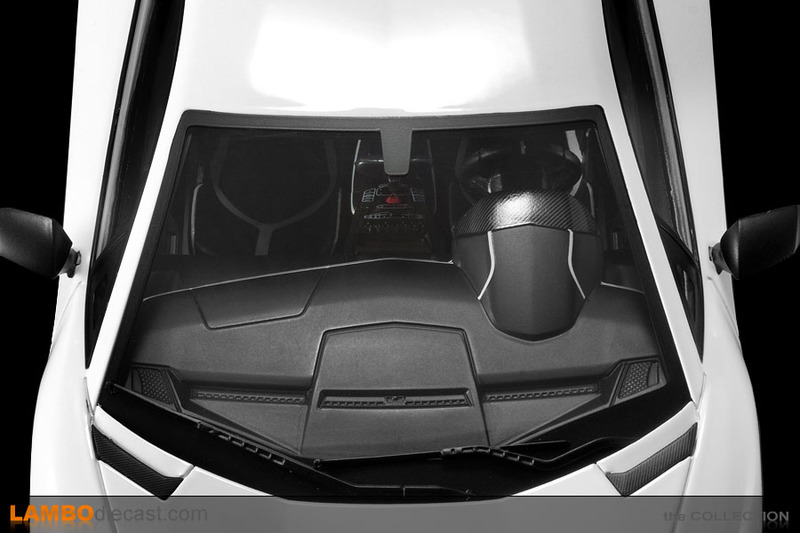 On the central console we find the optional Navigation and infotainment system just like on the Rosso Bia by Kyosho, and again there are no seat belts to be seen ... a small detail in an otherwise very nicely executed cockpit. 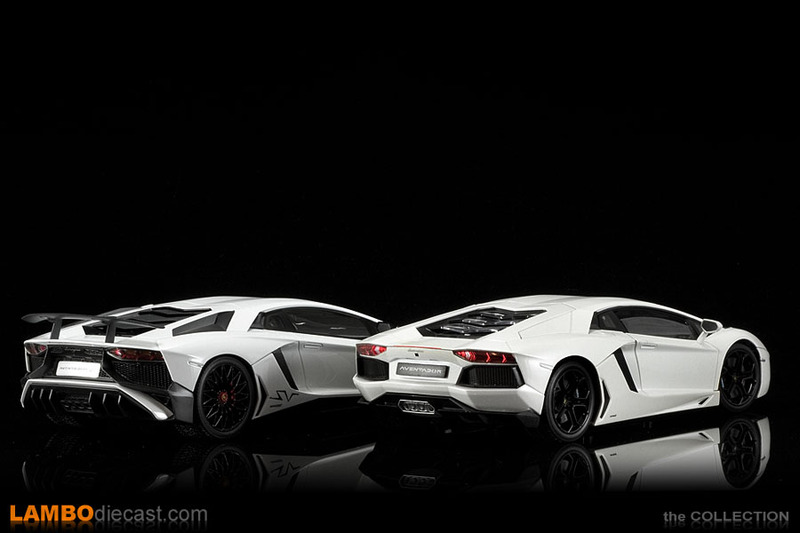 It is always nice to compare a new scale model against some other units in a collection, in this case, I put the Kyosho Aventador LP750-4 Superveloce against a pearl white metallic Aventador LP700-4 by FX Models, not really in the same price category, but a well-known model I think. 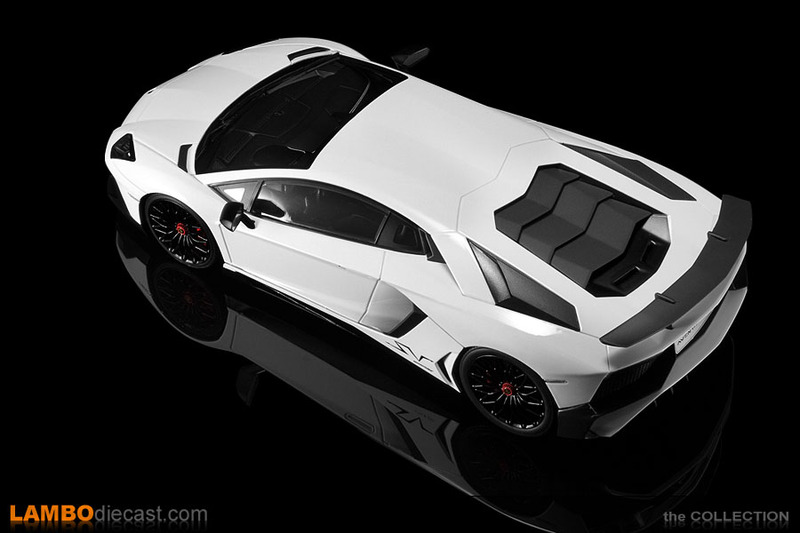 Because the FX Models Aventador is a pearlescent white paint it is a slightly different hue when compared to the solid white of the Kyosho model. 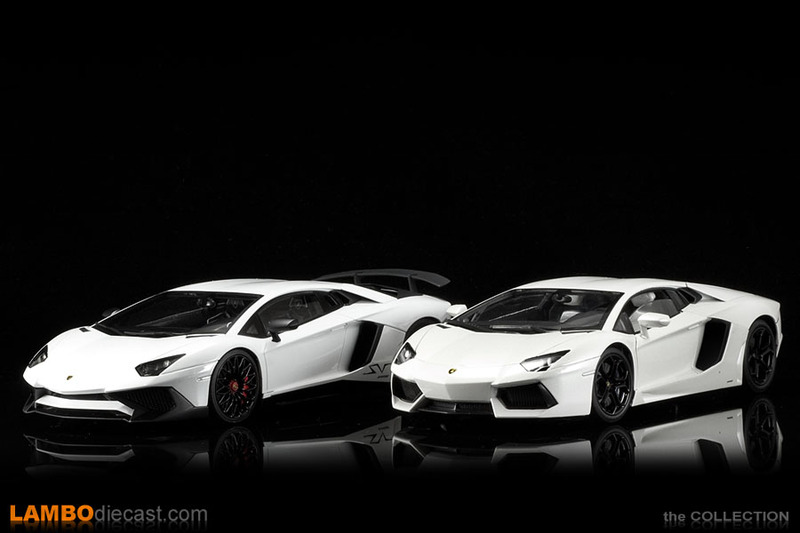 The pearl white has a minor yellow shade while the Kyosho one is a very bright white, but other than that I think they look really amazing side by side ... the difference between the original Aventador LP700-4 and the newer Aventador LP750-4 Superveloce are visible at once. 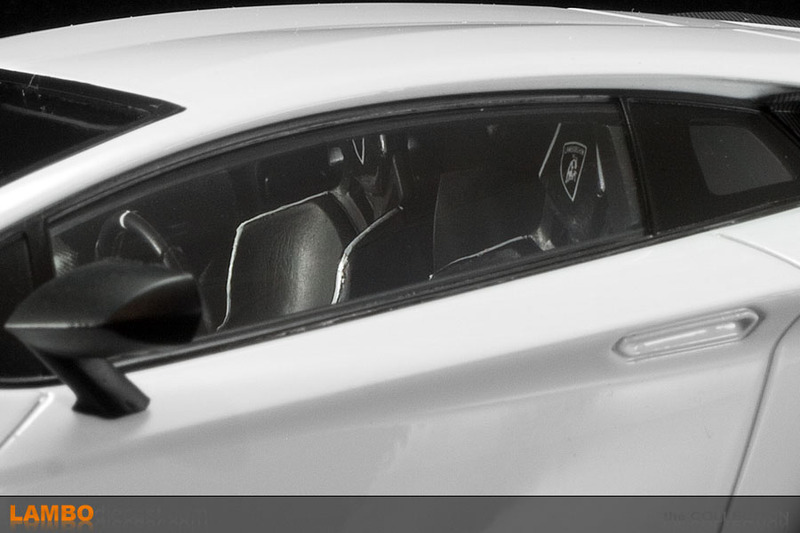 On closer inspection, the new Kyosho model is clearly at a higher level of perfection than the FX Models unit, both in attention to detail and in paint finish ... there are a few dust particles and paint flaws on the FX Models unit while the Kyosho one looks perfect, even up close ... and that isn't always easy with white paint. 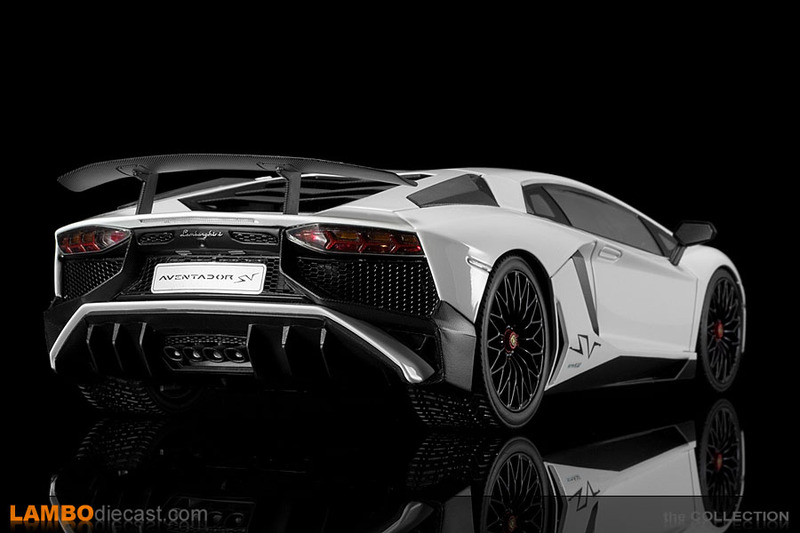 I couldn't resist putting the two most recent SV's side by side, so I took my Murciélago LP670-4 Super Veloce from AutoArt out of my display case and posed her next to the Aventador LP750-4 Superveloce. 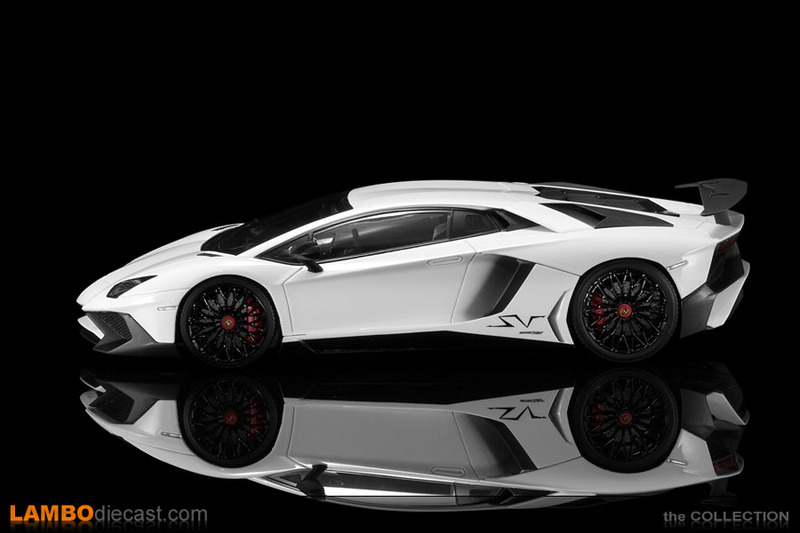 The AutoArt Murciélago Super Veloce is finished in matte white, they called it Bianco Canopus, but it is a solid white with a matte top coat, so not really Bianco Canopus, I still love it, especially with that large SV logo on the side. 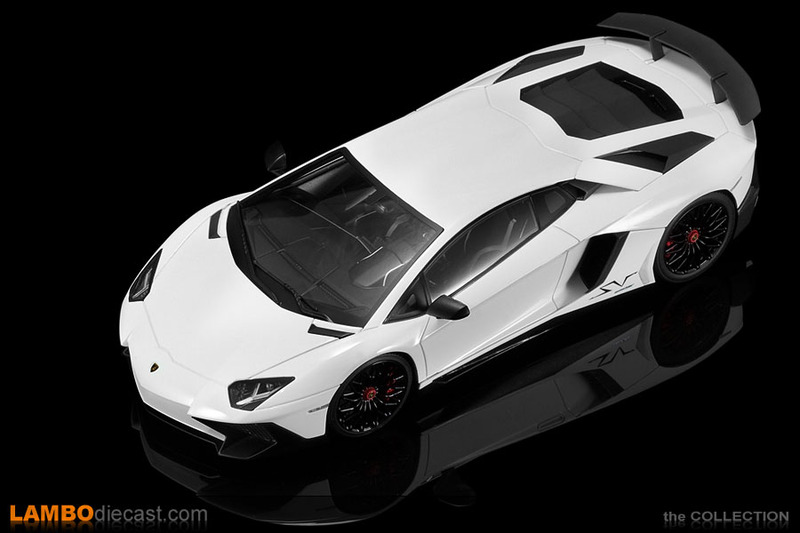 When I bought the Murcielago back in November 2011 this model cost €105, today the Kyosho Aventador costs €90 ... so a comparison isn't that far-fetched I guess (today the AutoArt Murciélago LP670-4 are at least €150). 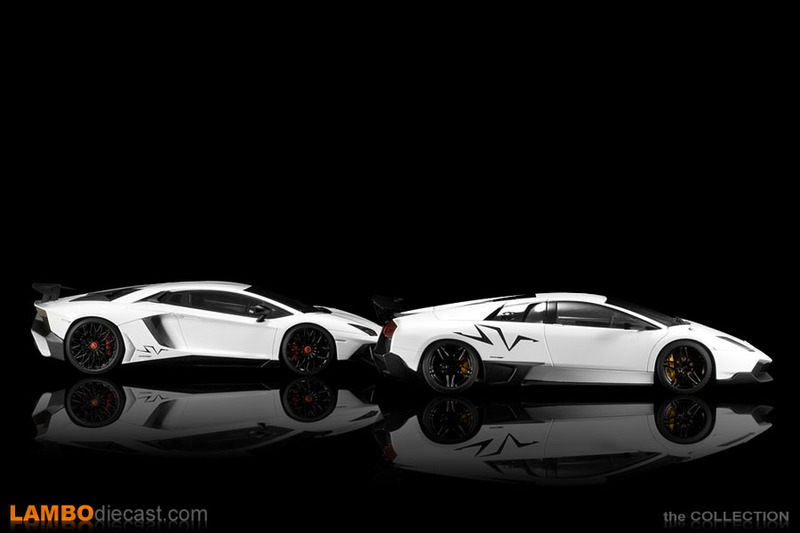 If you judge the look and feel of these two cars side by side they both ooze aggressiveness from every vent and intake, both cars are the top of the line in their respective range, and it shows, even on these scale models. Comparing the scale models I can only admit the AutoArt model is just that little better, more nicely done, finely detailed with a great looking interior ... 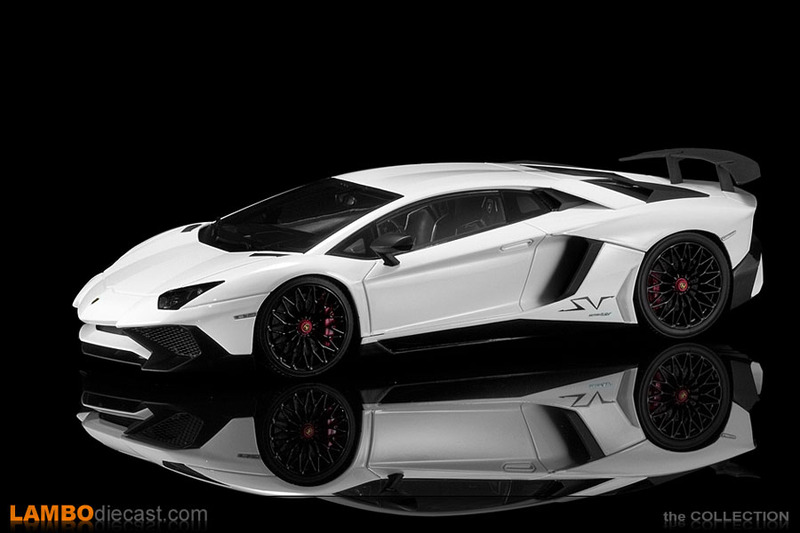 I have to say the AutoArt looks stunning, but the Kyosho isn't too far behind. 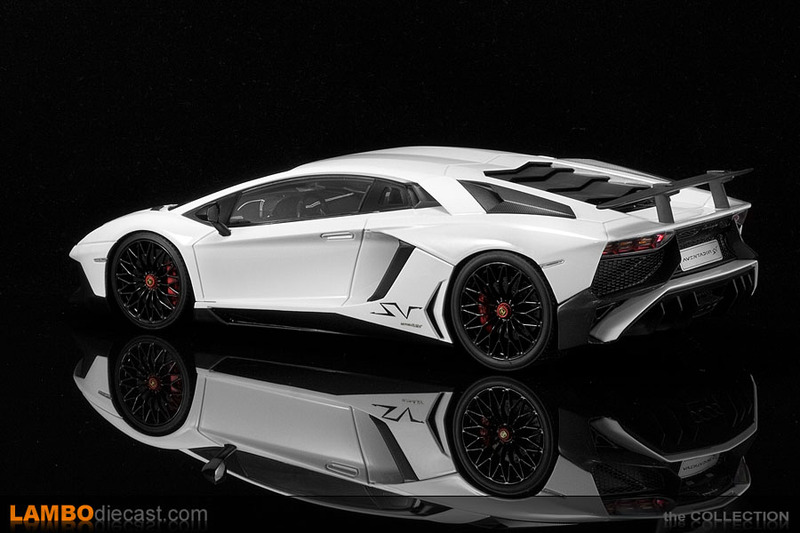 For a collector, these new 1/18 scale Lamborghini Aventador LP750-4 Superveloce models from Kyosho are the best value for money you can get, and unless AutoArt really surprises me with a low price when their version of the Aventador Superveloce comes out, I highly doubt I will have to revise this statement. 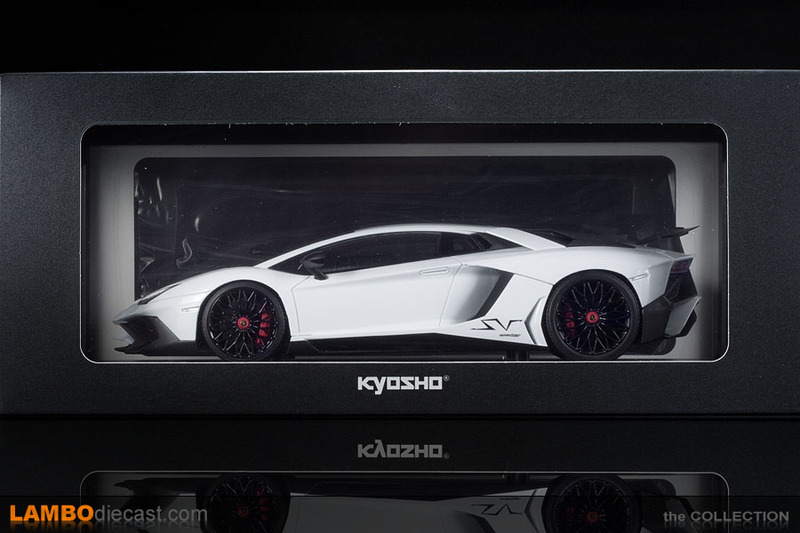 At €90 these Kyosho are really amazingly well made and very nicely detailed ... and with an AutoArt model that will probably cost three times as much when it becomes available in a few months I think many will think seriously about which one to get ... naturally at least one of the AA Superveloce will make it into my collection. 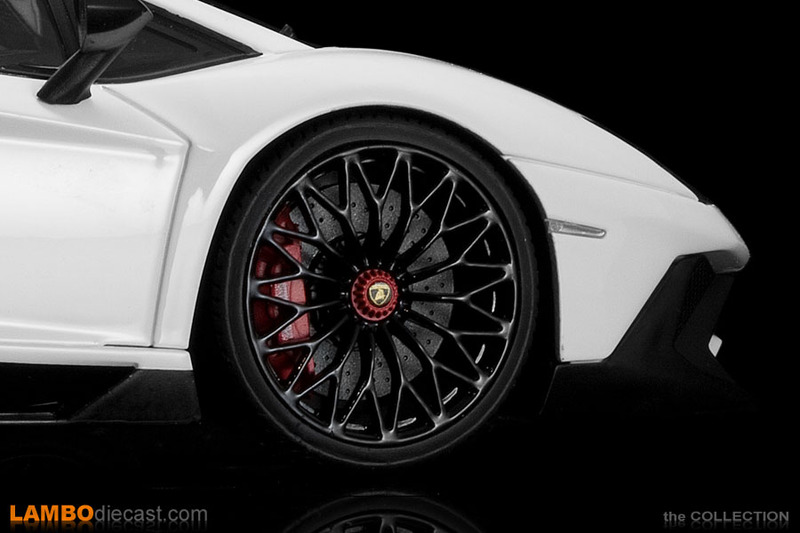 As for which shade to get from these two Kyosho models ... that's a difficult one, the Rosso Bia boasts a very nice, deep shine and beautiful metallic particles ... and it is an almost exact replica of the press release car. 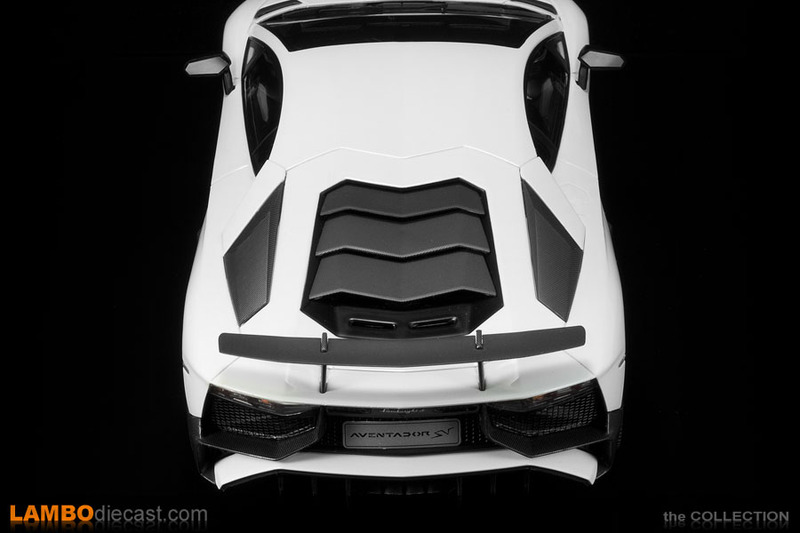 But I also really like this white shade which makes all those black and carbon parts stand out so nicely ... so in the end it all comes down to personal preference ... or you just buy both of them.